Questa voce sull'argomento crostacei è solo un abbozzo. Gli astici (Homarus Weber, 1795) sono un genere di crostacei decapodi della famiglia dei nefropidi. ^ (EN) Homarus, in WoRMS (World Register of Marine Species). 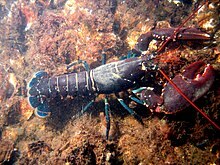 ^ a b Dale Tshudy, Clawed lobster (Nephropidae) diversity through time, in Journal of Crustacean Biology, vol. 23, nº 1, 2003, pp. 178–186, DOI:10.1651/0278-0372(2003)023[0178:CLNDTT]2.0.CO;2, JSTOR 1549871. ^ Carrie E. Schweitzer, Rodney M. Feldmann, Alessandro Garassino, Hiroaki Karasawa e Günter Schweigert, Systematic List of Fossil Decapod Crustacean Species, Crustaceana monographs, vol. 10, Brill, 2010, ISBN 978-90-04-17891-5. ^ S. Polkowsky, Decapode Krebse aus dem oberoligozänem Sternberger Gestein von Kobrow (Mecklenburg), in Tassados, vol. 1, Schwerin, privately published, 2004, pp. 1–126. (EN) ITIS Standard Report Page: Homarus, in Integrated Taxonomic Information System. URL consultato l'11/05/2008. Questa pagina è stata modificata per l'ultima volta il 6 ott 2018 alle 11:38.